Every day, I am reminded that people with disabilities are considered lesser by society. 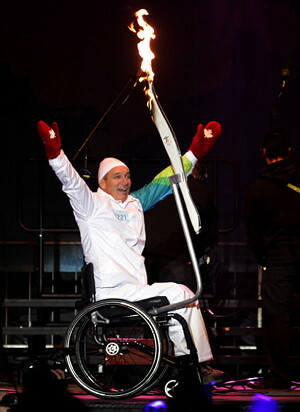 Which is why, when Rick Hansen rolled in tonight bringing the torch, I smiled so wide my face hurt. I asked for help and you delivered! Here’s the final disability bingo card for reporters! Folks seemed like they wanted one for Stuff People Say To You, so I might tackle that one next. Anyway as much as this is a rant against snobbery it is also a call to remember what is important. Look to that beautiful shifting central set of attributes that make us alike and different. Stop using the periphery to divide us. Then, via Helen @ Questioning Transphobia, we also now have access to a draft of the DSM-V (Diagnostic and Statistical Manual of Mental Disorders.) The final version of the DSM-V is currently slated for release sometime in 2013. So be sure to check out that draft, too! Why is this important? There’s a couple of different reasons; for one thing gender identity disorders and sexual dysfunctions are listed in the DSM, (yes even sexual dysfunctions caused by medical/health issues,) which is a powerful force behind having disorders recognized, researched, diagnosed, and treated. The manual is not without a fair share of controversy, however, particularly from a feminist perspective. Astrid at Astrid’s Journal: Temper Dysregulation Disorder with Dysphoria: The Missing Link or a Can of Worms? There is a new childhood mental disorder being proposed for DSM-V: temper dysregulation disorder with dysphoria (TDD). When I first read its criteria, my thoughts were: “Finally, it’s about time people are acknowledging not all children’s irritability is bad behavior.” Quite honestly, if this disorder had been around in DSM-IV in 1994, I would’ve been a surefire candidate for a diagnosis, except for the fact that autism should be ruled out first – but then again, I’m not sure autism would’ve been the first thing a shrink thought of when seeing me if TDD had been on the books. Those of us who live with invisible illnesses live in two worlds – the one where we “pass” if we are having a good day, and the world we retreat into when our symptoms flare. We may drop out of sight for a day or two or three, but people are so busy they may not notice we’ve been gone. Temple Grandin: Mick Jackson picked out Claire Danes. The reason why he picked her out was he’d seen her do a reenactment of the Andrew Wyeth painting “Christina’s World,” which is a painting of a lady that’s crippled. Claire Danes dragged herself across the street in New York like she was Christina, and then Mick decided that she’d be the one. Then, of course, Claire Danes, she became me. She didn’t just act me and learn the lines—she became me.